I love making fun cakes, like Joy, The Good Dinosaur and all the rest of them. 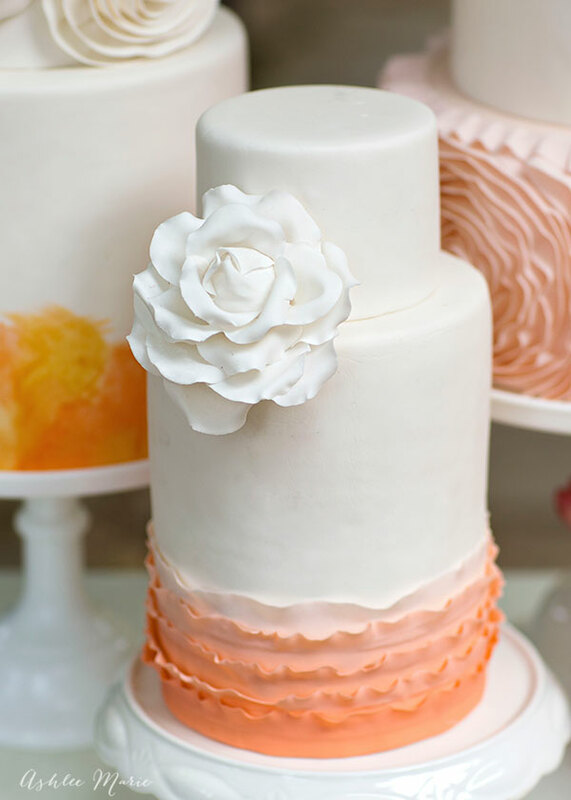 BUT as fun as those cakes are there is just something magical about making a wedding cake. Let’s face it, it’s the ULTIMATE cake! This Trio of cakes is probably my favorite to date. The entire wedding shoot was just lovely! It’s always fun to work on an inspiration shoot cause I get to design and create whatever I want and try out new ideas! My inspiration for the cakes were the dress and invitations. The Dress was a Maggie Sottero (I DIE, so pretty) and had beautiful ruffles, pleats and these huge soft rosettes in the skirt! So I knew I had to do the Fondant Rosettes for the largest of the three cakes. The Invitations were watercolored, so I used that on the middle cake and brought it back to the skirt, with ruffles, for the smallest cake. I am seriously still so in love with these cakes. 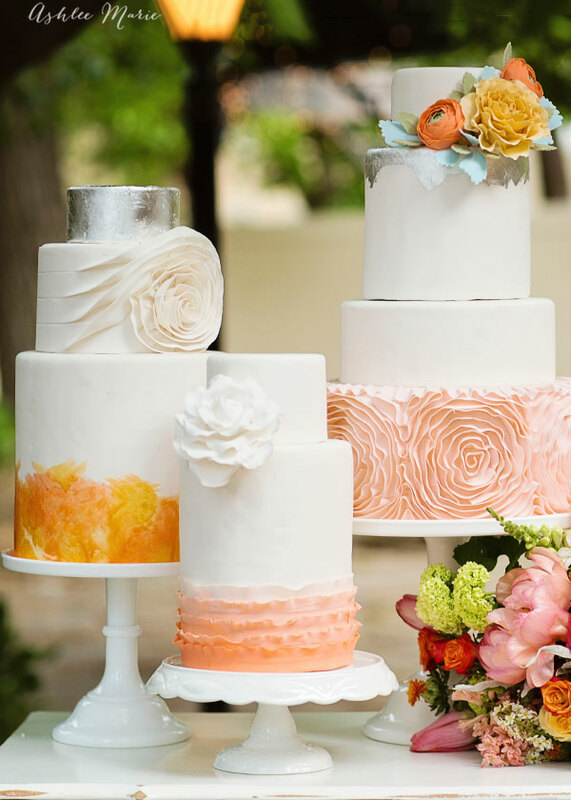 Each one by themselves could be the wedding cake, but together, with their details and different colors and techniques just really shine. I don’t know that I’d change a single thing from these cakes. When I was out on delivery the smallest cake fell over and the rose got destroyed, so I ended up creating a new rose on the spot, and while I thought I’d hate it I actually think the second, simpler, rose turned out even better. 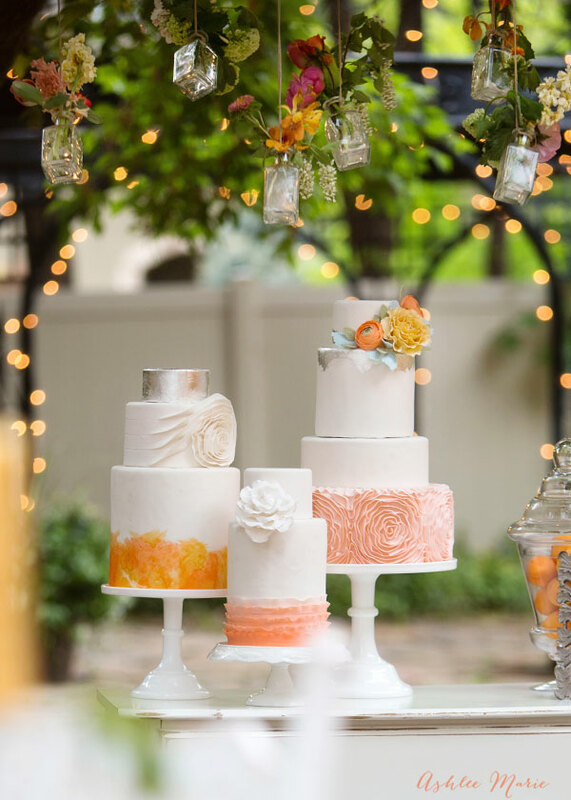 I loved all the details in the cake table, especially the hanging flowers from above. The lights around the location really set it all off. The florals were amazing, the table runner was all flowers, and it was simply stunning, and that bouquet? just amazing. I tried to go with flowers that would blend in with the bouquet and other florals, and I’m really happy with how they look all together. 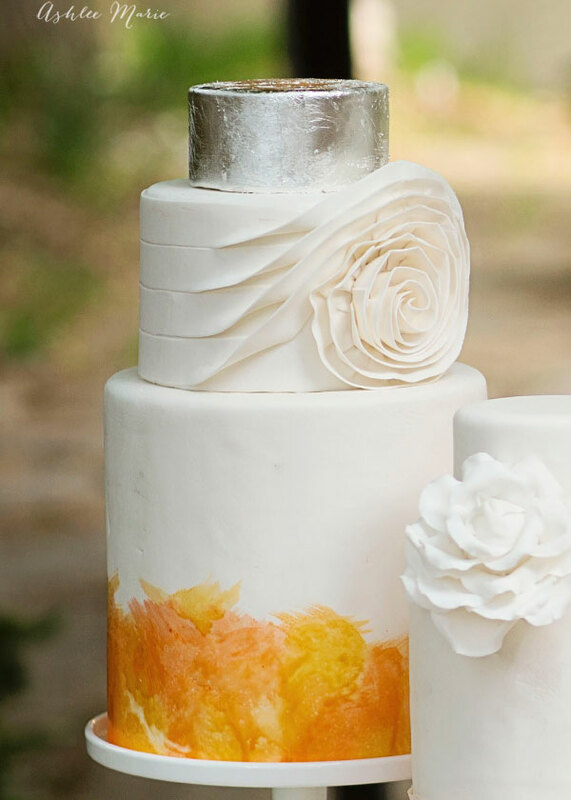 At the last min I decided to add the ripped silver leafing on the top, under the large flowers and I’m so glad I did, I think it helps tie in the middle cake, and even though you can’t see a ton of it from the front it is a sweet detail that you can see from other angles. Def a technique I want to use again. And of course the rosettes! Always a huge favorite of mine, time consuming to make but OH so worth it! the swirl into the single rosette is something I’ve been wanting to do for awhile so when I needed another white element to this simple mid sized cake I just KNEW it would be perfect, tying in the dress and the larger cake nicely. The hand painted water coloring on the base of the double barrel was so so SO much fun to do! I have been dying to water color on more fondant, it was super fun to do and matched the invitations perfectly. For the small cake I wanted to keep it super simple, I didn’t want to overwhelm the cake, but I still wanted to bring in fun elements. 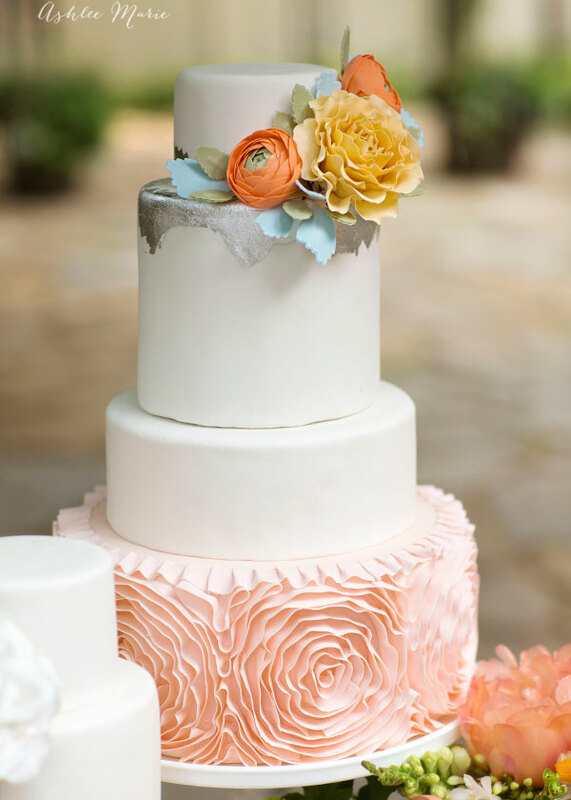 The simple ombre ruffles with the white rose were just perfect, standing out but blending in and looking just lovely. It’s not much cake at that size, but brought the trio together perfectly! This was actually all photographed last year and I’ve been dying to share it, but we had to wait until it got featured in Utah Bride and Groom. That’s always the hardest part waiting to share the amazing details. 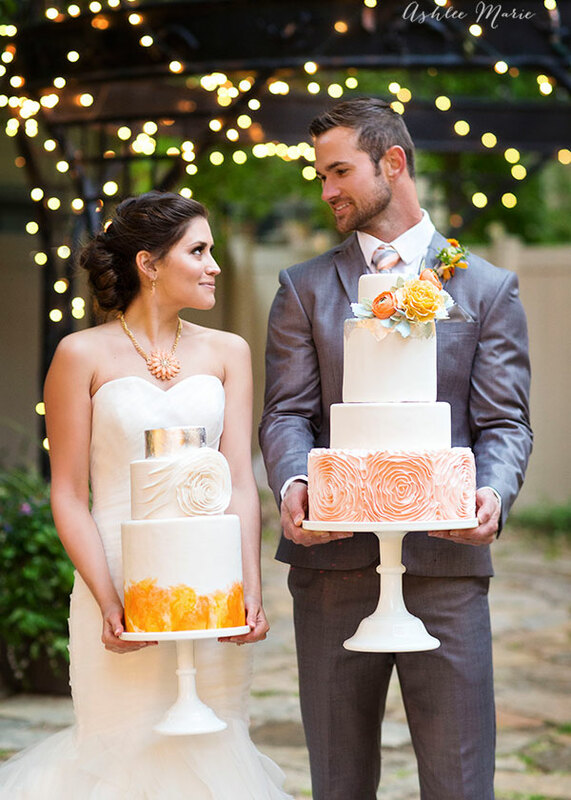 One of my favorite images from the shoot was this one, with the bride and groom each holding a cake! Something so fun about it. Thankfully I used cake dummies, otherwise they would have been CRAZY heavy! I’ve started to create tutorials from some of the techniques from these cakes (let me know which detail you’d like to see next! May I ask what sizes you used for all of these cakes and how many it fed? These are absolutely stunning. Thank you.